And what a celebration it was! Over 100 people attended the Fall 2018 Grants Celebration last night at Ongwanada. Many thanks to the donors and volunteers that made last night possible and a huge CONGRATULATIONS to our successful grantees. Last night we awarded 20 grants totaling $197,927.66 to local charities which will directly benefit over 4,000 people, half of them youth, with thousands of others to benefit indirectly. This round of grants awarded included a first-time grant of $5,094 to the Happy Tails Farm Sanctuary to enable them to offer an Inaugural Summer Education Program for youth as well as $19,575 to Kingston Employment and Youth Services (KEYS) to support the expansion of the Begin Again Group that facilitates the development of micro-enterprises into functioning local businesses for newcomer women in our community. 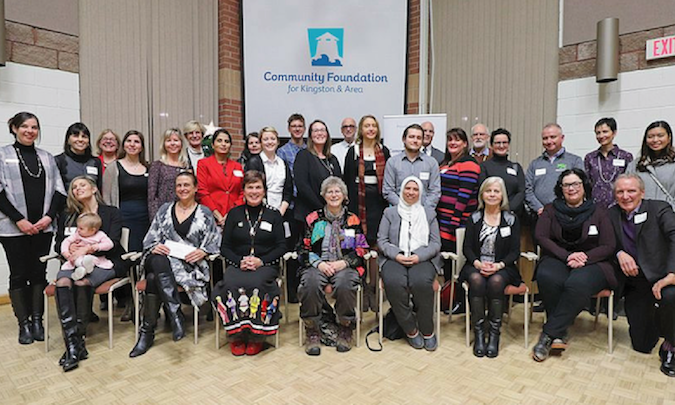 Amongst the broad range of projects funded – from arts and culture to youth – the Foundation is pleased to fund two projects that support the Truth and Reconciliation process locally including a grant to the Loving Spoonful for a project “Re-building Indigenous Culture and Language around Good Food”, and to the Kingston Historical Society to create an information panel for visitors to the Murney Tower that will share information about historical Indigenous land use in our community. The grant will provide opportunities to increase knowledge and experience of Middle Eastern instrumental and vocal techniques and dance, for Melos musicians and local public through open workshops on eastern dance (including belly dance), western and eastern chant and ancient instruments. The grant will also allow for Melos to participate in lectures and perform at the Colloquium Series Queen’s University in March 2019 faculty, students and the general public. The Murney Tower Museum National Historic Site is excited to be able to include a panel on the Indigenous land use of the area surrounding the Tower. It is a great opportunity to celebrate and acknowledge the cultural contributions of the Anishinaabe and Haudenosaunee peoples and their history that predates Murney Tower’s existence. “Skeleton Park Press” hopes to initiate a free 12-page biannual neighbourhood newspaper for the Skeleton Park neighbourhood and north end. This grassroots newspaper will increase community engagement inform public discussion and awareness of important neighbourhood issues and meaningful stories written by and about the residents who live here. Discover the Symphony is a series of concerts performed by members of the Kingston Symphony. These interactive concerts, which will take place in various locations outside of the concert hall, will provide opportunities for young people in our region to participate in a live performance, discover the instruments that make up an orchestra, and interact with professional musicians. Discover the Symphony will encourage children and youth to get involved in music and demonstrate how enjoyable and accessible classical music can be. The Psychology Clinic at Queen’s University’s Promoting Wellness by Identifying Support Needs for Children and Youth program focuses on supporting families in the highest need in our community by providing psychological assessments to identify their needs and appropriate supports for their learning and mental health. Securing supports early in learning leads to improved academic performance, school engagement and psychological well-being, leading to healthy futures for our children and youth. Kingston Health Sciences Centre has a close ongoing collaboration with the Limestone District School Board (LDSB) to provide consultation, psychoeducation and ongoing therapy and medication management for youth with complex anxiety and mood disorders along with difficulty attending school. This program is called the LINKS classroom and is funded by the school board with a teacher and an educational assistant. Book Clubs for Inmates operates seven monthly book clubs at Bath, Millhaven, Joyceville (Minimum and Assessment Unit) and Collins Bay Institutions, each with 10-18 inmates and two or three community volunteers, spanning all security levels. Participation enhances personal growth, leading to improved relationships with families and children, and more successful reintegration into society. The primary objective is to provide supportive camp opportunities in the Kingston area for youth who have learning disabilities. Specifically, the project will provide opportunities to integrate youth with learning disabilities into summer camp programs that address/support their learning and social needs. The connecting with Technology project will teach people with blindness and sight loss living in the Kingston area how to try, use, and access new technologies that can reduce social isolation and enhance their participation in the community. The Museum will develop a curriculum-linked education program on the topic of infectious diseases and immunization for students Grades 7 to 10. The program will explore the social, scientific, medical, and historic facets of infectious disease. The main objectives are to show the heavy toll that epidemics have taken; to develop a better understanding of microbiology, concepts of immunity and disease transmission, and specific vaccine-preventable diseases once common in Kingston. This purpose of the “Intensive Literacy Support Program” project is to expand the reach of education programs to serve a broader community, both in numbers and diversity, to allow children of all financial backgrounds to access high-quality educational services. Happy Tails Farm Sanctuary will establish a summer education program that focuses on educating children and the general public on matters of animal husbandry and welfare as well as providing access to an interactive rural environment, particularly for those who may not otherwise receive such an opportunity. Kingston Literacy and Skills (KL&S) will provide two sets of four targeted training programs, in the north and west ends of Kingston. Partnering with community agencies (Dawn House, St. Lawrence College Employment Services, ReStart, Ontario Works and mental health groups) these short-courses will be: G1 Preparation, Presenting your Best Self, Volunteering 101 and Steps to a Positive Future. Programs will be offered primarily on-site and Dawn House and Ontario Works, with additional activities at other community agency sites. KL&S will also provide a special digital technology course in conjunction with these programs, to ensure all participants have sufficient computer and technology skills. Family and community engagement is an essential component of improving outcomes for children and youth. That engagement extends beyond simple involvement by motivating and empowering families to recognize their own needs, strengths, and resources and to take an active role and allow our families to be a part of our team. The Kingston Indigenous Languages Nest (KILN) and Loving Spoonful will bring their strengths together to create a year of Indigenous language learning for all ages around good food. Indigenous participants will cook together bi-weekly, then, while lunch is in the oven, will learn: Anishinabemowin; Mohawk; and Cree in a safe, non-judgmental space as they work to rebuild language, culture and identity. Children cook with elders, then play language-based games and crafts. Hospice Kingston will deliver a specialized yoga program to meet the needs of individuals experiencing bereavement or major life loss. Lunch by George is operated by Outreach St. George’s Kingston to respond to the needs of the disenfranchised, alienated, and marginalized members of our community. They provide nutritious meals in a warm and friendly setting and encourage social opportunities for Kingston’s less fortunate. The Winter Warmth Program provides necessary clothing and footwear for children in need. This grant will send one child with physical disabilities to a fully accessible summer camp. The Foundation has two community grants rounds per year, to which all local charities can apply. The next application deadline for local charities is February 15, 2019.